The story of humankind’s past is called history. History tells us about various developments which have taken place in the human society in different periods. History helps us in knowing about the past kings, kingdoms and the society. History tells us about the way people lived, the food they ate and the clothes they wore. History tells us about the occupations of people. History tells us about the great achievements of our ancestors. History tells us about the mistakes made by our ancestors. History also tells us about the games children played during a particular time. We learn from history to make a better future. During prehistoric times; people lived at following places in the Indian subcontinent. River Narmada: For several thousand years; people lived near the banks of the Narmada. They were hunters-gatherers. It means; they were nomadic, i.e. did not lead a settled life. Sulaiman and Kirthar Hills: People lived in the Sulaiman and Kirthar Hills about 8000 years ago. They were among the first people to begin farming. They used to grow crops; like wheat and barley. They also begun to domesticate animals; like sheep, goat and cattle. People lived a settled life. Villages came into origin around this time. Garo Hills and the Vindhyas: People living in Garo hills were among the first to grow rice. Rice was also grown towards the north of the Vindhyas. Indus and its tributaries: The earliest cities developed near the banks of Indus and its tributaries; around 4700 years ago. Ganga and Son: It was about 2500 years ago when cities also developed on the banks of the Ganga. 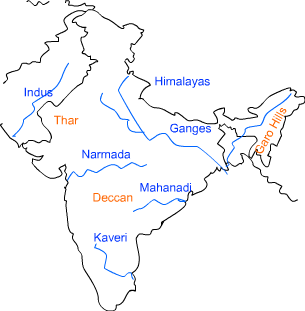 Some cities also developed along the tributaries of the Ganges. Some cities also developed along the sea coast.